Clock boasts a digital display light and alarm features. Great gift for the LEGO collector! 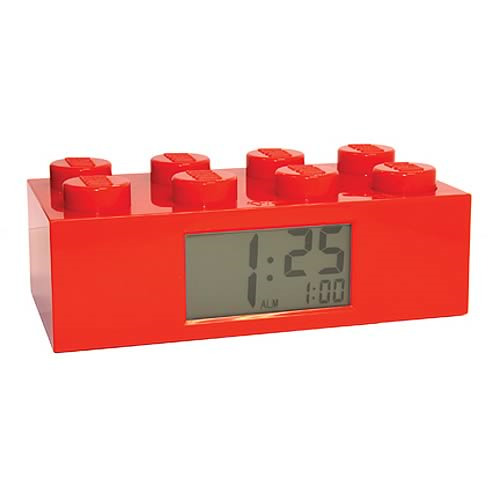 No matter your age, you're going to love the timeless look of this LEGO Red Brick Alarm Clock! Beloved by generations, LEGO has become synonymous with cool toys, and this clock is no different. Made to look like a classic red LEGO brick, the LEGO Red Brick Alarm Clock features a digital display light, alarm and snooze functions, and a 12 or 24 hour time option. Measuring 7 1/2-inches long x 3 3/4-inches wide x 2 1/4-inches tall, the LEGO Red Brick Alarm Clock requires 2x "AA" batteries, included. Ages 6 and up.